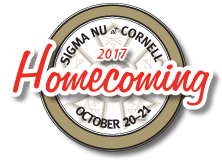 The brothers of Sigma Nu want to see you at Cornell Homecoming in October and have a great set of events planned. We had a great turnout at 230 Willard Way last year at Homecoming, which was capped off with an awesome backyard bonfire, and again expect to see a large number of returning alumni this year. Check out the activities, and mark your calendar to be at Sigma Nu in October. No RSVP is required; just show up! All alumni and undergraduates encouraged to attend! Learn the latest about our chapter and our plans for the future. 230 Willard Way. Cornell football vs. Brown: 3:00 p.m.
Come cheer on the nearly 20 Sigma Nu brothers who play varsity football. Schoellkopf Field. Homecoming reception: 6:00 p.m. – 7:30 p.m.
All alumni, undergraduates, family, and friends are welcome. Cocktails and appetizers will be served. 230 Willard Way. Finish off your day in Sigma Nu’s backyard. All are invited. 230 Willard Way. You can connect with Commander Bob Kaleel ’19 at 440-371-6447 or rmk287@cornell.edu, or Property Association Secretary Nick Carino ’69 at 440-557-5134 or ncarino@roadrunner.com. Also check out Cornell's Homecoming page.